Last weekend was my farewell to the Connecticut Renaissance Faire for the season. 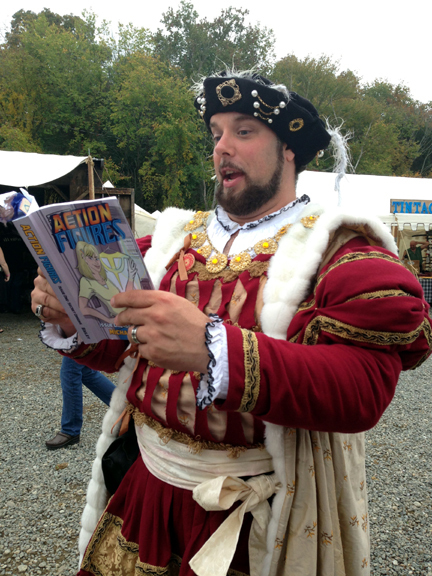 King Henry VIII (Christian Galpin) treats the peasants to a dramatic reading of Action Figures at the Connecticut Renaissance Faire. Yes, it was as weird as it sounds. My wife’s assistant Kate is back for the final weekend (after taking a few days away to go to New York, get engaged, and meet Captain Marvel writer Kelly Sue DeConnick while dressed as Captain Marvel…and yes, you read all that correctly), which means I get to stay home and work on draft one of book two of Action Figures. That’s right, I am already working on the sequel, and I have been getting the “Write faster!” treatment from people who have already blown through book one, and want to be on the test-reader list for book two. Flattering, that. As flattering as all the requests I received over the weekend to sign copies of my book. I think I signed eight copies, and one thing I learned: it’s tough coming up with unique and witty inscriptions. But it’s a good problem to have. I also received a few inquiries about the e-book version, and so far things are on-track there. I’m expecting the Kindle version to be ready to go next week, and sorry, Nook owners, it’ll be a lot longer before you see a version. I’m taking advantage of the Kindle Direct Publishing perks, which means I’m locked into a Kindle-exclusive deal for 90 days from the e-book’s release, so non-Kindle owners will have to wait a few months more (or download one of the many free Kindle aps for your computer, tablet, or phone).